I've been working away at my Baltimore's Country Cousins quilt. 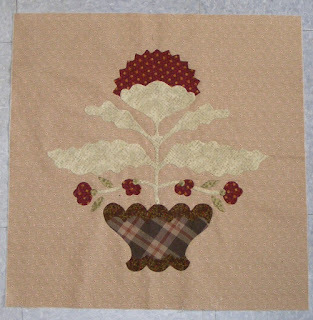 This is the Scottish Thistle block! I'm plugging away at another block and hope to have a show and tell soon. I'll be happy when that quilt is done. Gosh, I think I started that in 2004. I'll have to check my date! 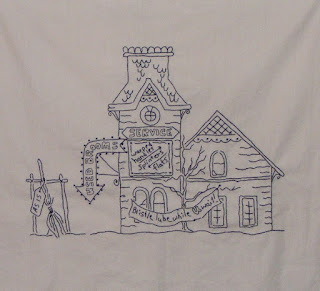 I've also been working on my Hocuspocusville quilt, a pattern from Crabapplehill Design. I am enjoying working on this quilt. It's so mindless! Sometimes, I need that! That is a very pretty thistle block. Love the touch of plaid. Are you anywhere near Greek Peak? I always enjoyed skiing there. You certainly have been doing a good job posting regularly - I've been working on that as well. Love the photo of the barn. And you've been quilting regularly as well. Both blocks are great. Love that appliqué block...very pretty.